On these tricky easterly winter days, even a small flight can be supremely gratifying. Today’s easterly trickiness offered us opportunities for small wing soaring at Koko Crater, brisk smooth ridge soaring at Makapuu, and a rock and roll thermic cross country mission at Kahana. Naturally I chose the latter option, from where I happily spiraled up to play over my back yard between wispy convergence clouds. Thanks to Woody for being the calm voice of reason on such a strange super easterly day. We met at the boat ramp, looked at the clouds drifting offshore, the wind lines curving offshore, the sensor numbers stubbornly spiking south of east, and he said: I think we can do this. We hiked up but I really wasn’t sure it was going to happen. On launch it was strong and very gusty. I was seriously considering hiking down, but then Woody offered to go first and show me just how horrible the air was. I called him a guinea pig, but what I meant to call him was the lead scientist of our thermal research team. The air turned out to be not that horrible at all, but it was quite tricky to figure out. I joined him and we turned circles everywhere along the ridge, trying to connect with something to get us up and out of the easterly soup. After a couple of false leads, finally I caught a live one, and I cashed in my chips and headed to Punaluu, where I knew from experience the thermals were going to be working like gangbusters. 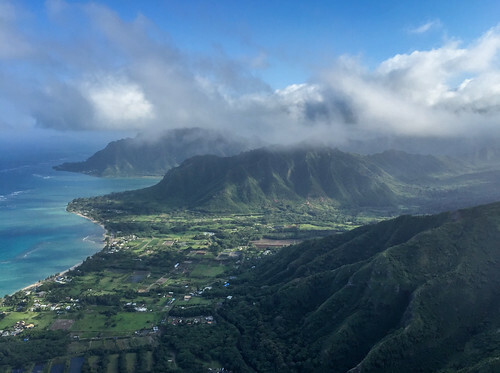 Sure enough, I was busting gangs straight to cloud base over the Punaluu ridge, as I watched Steve and Berndt join Woody above Kahana. The clouds were forming all around me and streaming over the ridge as I turned easy circles between those misty fingers. It was magical. After a while I saw the other guys all heading over for a landing on the beach in Punaluu, where we had staged Woody’s car. I decided to surf the cloud bellies to a berth at Hauula, the nearest really nice landing zone. The air was sweeping as east as I’ve ever felt it down there, or possibly more, but the landing was easy and fun. Thanks to Woody for the quick retrieve! And it was great to hang out with Berndt for a while at the beach at Kahana on the last full day of his trip.